South Florida, Fort Lauderdale - Miami. Visitor Attractions and Things to See and Do in Broward County. Travel places and destinations. if you are traveling or visiting us. Ancient Spanish Monastery - The Monastery of St. Bernard de Clairvaux was built in Sacramenia, in the Province of Segovia, Spain, during the period 1133-1141. In 1925 William Randolph Hearst purchased the Cloisters and the Monastery's outbuildings. The structures were dismantled stone by stone, bound with protective hay, packed in some 11,000 wooden crates, numbered for identification and shipped to the United States. Bar-B-Ranch - Visit Bar-B-Ranch for horseback riding lessons. They teach both English and Western styles of riding. It's a great place to ride, whether you're a beginner or an experienced rider. They have appropriate horses for nearly every level of riding experience. Buehler Planetarium - This state-of-the-art facility features a 40-foot dome using a Definiti fulldome video system that lets you see the night sky as it should be seen—without city lights. Attend day or evening shows designed to educate and entertain. Bonnet House Museum & Gardens- Fort Lauderdale. A Visual Tour through the art galleries and rooms of one of the premier historical homes in South Florida, a stunning testament to an elegant and romantic era. Built in 1920, Mr. Bartlett's personal interpretation of a plantation house was designed to promote a gracious indoor-outdoor lifestyle filtered by coastal breezes from the Atlantic Ocean and to express his sense of whimsy with decorative delight. The life and love shared at Bonnet House radiates from within the artistry of the home and tranquility of its thirty-five acre setting. Bonnet House, named after the yellow water lily that once grew in the property's marshland, exemplifies the lives of the families who owned the property for nearly a century. Brownies Bar Tavern - is Fort Lauderdale's oldest bar. Brownie Robertson obtained the first liquor license in Fort Lauderdale when he opened this bar in 1939. (south in Dade County, where is Miami is, was a dry county). A faded black and white photo of beer being delivered by a two horse-powered truck paradoxically hangs on the wall near the Pearl Jam-filled Touch Tunes jukebox. Photos of entertainers from the '30s and '40s also hang from the wall and serve as reminders of times past. You can find nostalgic portraits in just about any bar, but many of these relics are inscribed with the words, ''Thank you, Brownie'' -- Brownie Robertson would hire black musicians when it was extremely unpopular to do so. Even though this establishment is more than 65 years old, it doesn't look like it has been around since the before World War II. But that said, the decor is light-years away from strobe lit, ultra modern, South Beach nightclubs. Brownie's is simply one of those timeless saloons with an unchanging look: wood paneling, neon beer signs, two pool tables and green cushioned bar stools. Occupying these stools are Average Joe's like myself, high-profile judges from the nearby courthouse, and everyone in between. Sitting next to me was a middle-aged woman who remembers being a little girl at this bar when her mom stopped in from time to time for a few cold ones. (Editors note: The bar was on Andrews avenue and just north of south 17 street, almost across from Broward General Hospital). Sadly, it was destroyed by greed and lawyers in 2010. Butterfly World - Amidst thousands of flowers, tropical plants, waterfalls, gardens, and classical music, Butterfly World is a unique, breath-taking site that is one of Florida's leading tourist attractions. The Tropical Rain Forest Aviary is one of Butterfly World's finest attractions. This mammoth 8,000 square foot screened enclosure is a marvelous, open air environment within which to enjoy the flight of thousands of live butterflies. It is also the largest single butterfly habitat in the world, soaring to 30 feet in height and enclosing 240,000 cubic feet of space. Inside, over 5,000 butterflies enjoy a natural rain forest environment, complete with flowers, trees, a waterfall, a cave and a cooling tropical mist. Coral Castle- Since it is documented that no one ever witnessed Ed's labor in building his rock gate park, some say he had supernatural powers. Ed would only say that he knew the secrets used to build the ancient pyramids and if he could learn them, you could too! Now we wonder what exactly was the source of inspiration that drove this man for 28 years to carve a Coral Castle from the ground up using nothing but home made tools from junk parts. Unrequited love? Ancient sciences that defy gravity, or just sheer, raw human determination? The Coral Castle is an everlasting mystery to those who explore it. Coral Gables Venetian Pool- Fed by underground artesian wells, Venetian Pool was once a quarry pit, its only value being limestone it produced for the construction of that time. Through the creative efforts of Merrick's artist-uncle Denman Fink, and architect Phineas Paist, this eyesore was transformed in 1924 to what was then called Venetian Casino. During its heyday gondolas plied its waters. Esther Williams and Johnny Weismuller of Tarzan fame swam its length. The orchestras of Paul Whitman and Jan Garber serenaded pool side dancers as they swayed beneath the stars on outdoor terrazzo dance floors. Everglades Alligator Farm- Everglades Alligator Farm, one of Homestead's busiest attractions draws tourist and camera crews from all over the world. The privately owned attraction is a real working alligator farm, according to owners, Charles and Deborah Thibos. The Everglades Alligator Farm is currently home to about 2,000 alligators of all sizes. The smaller alligators are kept in grow out pens and the larger alligators are in natural settings called breeding ponds. It takes about 6 years for an alligator to start breeding. The female alligator will have only one clutch of eggs a year, depending on the mother's age and fertility the clutch will contain up to 45 eggs. A trip to the alligator farm includes an exciting airboat tour into the surrounding Everglades and a walk around the farm to see the alligators, crocodiles, caimans, and wildlife. Everglades National Park- Here are no lofty peaks seeking the sky, no mighty glaciers or rushing streams wearing away the uplifted land. Here is land, tranquil in its quiet beauty, serving not as the source of water, but as the receiver of it. To its natural abundance we owe the spectacular plant and animal life that distinguishes this place from all others in our country." With these words, President Harry S. Truman formally dedicated Everglades National Park on 06 December 1947 in a ceremony held at Everglades City. This event culminated years of effort by a dedicated group of conservationists to make a national park in the Florida Everglades a reality. The Visitor Center near the main park entrance is dedicated to one of the foremost of these far-sighted individuals, Ernest "Tom" Coe. Fairchild Tropical Botanic Garden - Assembling and maintaining an outstanding botanical collection has been a fundamental part of the institution's existence since 1938. Indeed, even before Fairchild Tropical Botanic Garden was created, Montgomery and Fairchild dedicated themselves to collecting, documenting and studying tropical and subtropical plants from around the world, especially the palms and cycads which are still the most significant Fairchild collections. Flamingo Gardens & Wray Botanical Collection - See a touch of history on 60 acres of lush gardens, showcasing rare, exotic and native plants. Tour the citrus groves and the Wray Botanical Collection. Explore the "Free-Flight" Aviary, Everglades Wildlife Sanctuary and historic Wray Home. Visit our gift & garden shops and enjoy an eco-experience of the Florida Everglades. Fort Lauderdale Antique Car Museum - Founded by Arthur O. Stone, former CEO of Buning the Florist, Inc., the museum has assembled a collection of pre-war Packard automobiles and other memorabilia, which represents Mr. Stone's love for this unique automobile. Contains 22 Packard automobiles from 1900 to the 1940's, along with a gallery dedicated to the late President Franklin D. Roosevelt plus several special collections of automobile memorabilia. Gator Park - At Gator Park you'll see all sorts of wildlife - such as alligators, turtles, snakes, fish and exotic birds -as you take one of our famous Airboat Rides deep into the Everglades National Park. All our tours are narrated by professional guides so you'll have the opportunity to learn about the unique wetlands and its native inhabitants. Goldcoast Railroad Museum - The Gold Coast Railroad Museum is a non-profit organization dedicated to preserving, exhibiting, and operating historic railroad equipment. The Gold Coast Railroad Museum has over 40 pieces of railroad rolling stock and equipment. International Game Fishing Association Museum - The IGFA Fishing Hall of Fame & Museum is one of South Florida's most unique and exciting attractions. Stories, records, and accomplishments of recreational fishing's finest. Overhead, life-sized mounts of world-record sport fish float in formation, surrounded by flags from various IGFA member nations. Exhibits of World Record catches from All-Time Greats to new Pending Records. As you go through the World Records Gallery see the decorative awards case. Be sure not to miss a visit through the virtual bait & tackle shop. The Wetlands Walk exhibit mimics the natural environment of swamps, marshlands, and mangroves. No detail of these complex ecosystems is overlooked to help communicate a realistic perception of these fragile habitats teeming with life. (right next door to this place is a Bass Pro Shop as well). International Swimming Hall of Fame - The International Swimming Hall of Fame (ISHOF) in Fort Lauderdale, Florida, is the mecca and international showplace for swimming, diving, water polo and synchronized swimming. The Museum, Library and Archive contain the world's largest collection of aquatic memorabilia and the single largest source of aquatic books, manuscripts and literature. As Olympic swimmer and Tarzan, Johnny Weissmuller said at the Hall of Fame's inaugural in 1965, "I am happy and honored to be recognized among swimming's elite athletes. It is here where I will keep my swimming memorabilia, tell stories of my days in swimming and the movies and offer my services towards the pursuit of helping each youngster pursue their dreams." Johnny did this until his death in 1984, but at the Hall of Fame, his spirit continues to live to inspire the youth of today and to serve as a model for which young athletes can strive. Jackie Gleason Mausoleum - The Great One lies in Miami. Jaxson's Ice Cream Parlor - South Florida's Favorite Old-Fashioned Ice Cream Parlour and Restaurant! While the Ice Cream eatery enjoys over half a century of continued operations, the history which is Jaxson's, predates the year 1946 when the Udell family moved to South Florida from the East bringing with them decades of old recipes for ice cream and food preparations. Jaxson's takes special pride in all of its products. Jaxson's Ice Cream and topping are prepared daily on the premises using the freshest dairy cream, berries, and nuts. Jungle Queen - For over 60 years, Fort Lauderdale, Florida's legendary Jungle Queen Bar-B-Que and Shrimp Dinner Cruise is known throughout the world, and it's more than 14 million guests over the years have enjoyed the fun-filled, relaxing evening aboard the Jungle Queen. The cruise up the New River , the "ALL YOU WISH TO EAT" dinner, the variety show and the sing-a-long have made it a "Must" in Fort Lauderdale. There is nothing else like it, and when your friends find out you were in Fort Lauderdale, they'll ask, "Were you on the Jungle Queen?". (editors note: If you are a couple of adults enjoying a night out, you will probably want to ride the large Riverboat. However, if you want to hear great stories and learn something of Fort Lauderdale and the New River, the smaller boat is the way to go. It doesn't provide drinks, food and such, but you can hear the guide, it's quieter, and has more "fun" factor to it for the kids. More personal. Also, even though the large boat starts out first for Dinner followed by the smaller boat, when you get to where you eat, it pulls over and let's the smaller boat to the dock first !). Jupiter Inlet Lighthouse - The Jupiter Lighthouse (somewhat actually north of Fort Lauderdale a bit) not only serves to warn approaching ships of the treacherous reefs so closely located to the shipping lanes in the Gulf Stream, but it is said that the light's beam also served the early mariners northbound from the tropics as a landfall from which they could catch the northern flowing current to aid them in making good time to northern ports. The lighthouse lens is a Fresnel lens, in this case the First Order Fresnel lens. There are only thirteen of these early First Order lens still in use in the United States. The light flashed for 1.2 seconds, eclipses for 6.6 seconds, flashes again, eclipses 21 seconds and then repeats the cycle. It can be seen for a distance of eighteen miles. It has one million candlepower. Mai-Kai Restaurant & Show - The award winning cuisine includes Cantonese and American dishes from fresh seafood and steaks grilled to perfection, to house specialties like Peking Duck, Rack of Lamb and Lobster Bora Bora. Each Room reflects a different region of Polynesia and overlooks a waterfall or lagoon. Stroll by giant tiki sculptures standing guard over the gardens. The exciting 45 minute Islanders Revue is performed twice nightly by native Polynesian dancers in colorful costumes. The beautiful maidens and agile warriors recreate, through dance, details of many facets of life in the Islands. Miami Metro Zoo - This zoo is so amazing. First, it's huge. It has wide open spaces for all the animals. It has all kinds of special programs and ways to enjoy not just the animals, but the whole area, such as bicycles or canoe tours. Don't miss their White Tigers. (editors note: if you visit during the summer, be ready for some heat. The walkways are really wide and out in the open sun. Be sure and drink up and have a hat, sun tan lotion, to beat the rays. During the heat, the animals, like humans, like to be lazy, and would be more active during cooler months). Miami Museum of Science and Planetarium - Late 1966 was the construction of a Space Transit Planetarium which soon became the leading facility of its kind in the world. Its activities now include international television programming. The next decade, which brought the association of 15 affiliate clubs representing various scientific disciplines, broadened the scope of activities offered and provided an important forum for exchange. During the last decade, the Museum has expanded to provide space for 4,000 member families, over 250,000 annual visitors, one of the largest summer science camps in the nation (ages 3 to 14) and countless additional exhibits, collections and activities. Monkey Jungle - MONKEY JUNGLE was an innovator of many of the concepts currently seen in the design of zoological parks. It is home to nearly 400 primates, most running free on a 30 acre reserve. It is one of the few protected habitats for endangered primates in the United States and the only one that the general public can explore. A total of 30 species of primates are represented at MONKEY JUNGLE including gibbons, guenons, spider monkeys and colobus. The Golden Lion Tamarin is native to the Brazilian jungle. Threatened with extinction, MONKEY JUNGLE proudly participates in an international effort to save the tiny creature. (editors note: if I remember right, the original spider monkeys were released to the Florida wild when the old 1930's Tarzan movies were being filmed ). Morikami Museum & Japanese Gardens - Since its opening in 1977, The Morikami Museum and Japanese Gardens has been a center for Japanese arts and culture in South Florida, with rotating exhibitions in its galleries, tea ceremonies performed monthly in its Seishin-an tea house, an educational outreach program with local schools and organizations, and Japanese traditional festivals celebrated for the public several times a year. The Morikami Museum Collection houses 5,000 Japanese art objects and artifacts, including a 500-piece collection of tea ceremony items, more than 200 textile pieces and recent fine art acquisitions. The 200 acres that surround The Morikami’s two museum buildings include expansive Japanese gardens with strolling paths, resting areas, tropical bonsai collection, small lakes teeming with koi and other wildlife, nature trails, pine forests and park and picnic areas. Museum of Art - Located in the heart of downtown Fort Lauderdale's Arts and Entertainment District, the Museum of Art|Fort Lauderdale is Broward County's most exciting venue for cultural activities. The Museum features an ever-changing menu of exhibitions, along with an ambitious education program offering art classes in a variety of media and subjects for all ages and skill levels, and weekly special events ranging from jazz concerts to lectures to yoga lessons. Ocean World - Ocean World Fort Lauderdale is gone, it was closed down in 1994. But it had all the aquatic attractions, such as alligators, sharks, and of course dolphins. 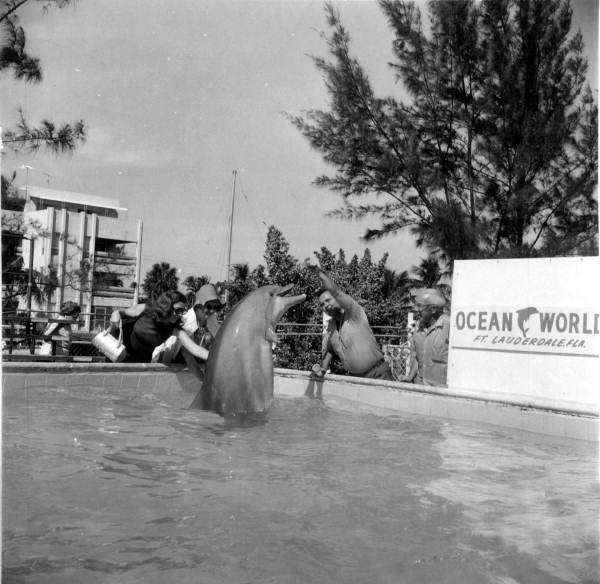 Ocean World was located on SE 17th Street just west of the inter coastal bridge on the north side. No, this is not where Flipper was filmed, that was the Miami Sequarium. (editors note: At Ocean World, at least during the day, some Dolphins where in a small tank low enough to where you could reach in and touch them. Which I thought was just awesome the first time I went as a kid ). Old Fort Lauderdale Village & Museum- Old Fort Lauderdale Village offers many programs and activities. These include: teaching children about pioneer life through hands-on reenactments, a museum of pioneer lifestyle, schoolhouse class programs, guided tours of exhibits in the museum of history, guided walking tours of the historic district and special events and lectures throughout the year. Palm Beach Maritime Museum- Following a lengthy restoration and construction program, they now have four facilities: 1. The former U.S. Coast Guard Station, Boathouse and President John F. Kennedy command post and bomb shelter on Peanut Island; 2. The marine science field office and dock on the Intracoastal Waterway; 3. An educational center, preview building and ferry dock at Currie Park in West Palm Beach and 4. the new location for our Palm Beach Maritime Academy K-8 Charter School. Parrot Jungle - Austrian born Franz Scherr came to America in 1911, and 25 years later, he started a most unusual tourist attraction, Miami's Parrot Jungle. From this rapport with nature, Franz Scherr created a most unusual attraction. Parrot Jungle is now the home for 1,100 tropical birds, 2,000 varieties of plants and flowers, and the best trained bird show in the world. It is a place where exotic birds "fly free" everyday. Seminole Tribe of Florida - The Ah-Tah-Thi-Ki Museum is one of the finest American Indian museums in the United States. It features the nation’s largest display of the life and culture of the unconquered Florida Seminoles through exhibits, rare artifacts and cultural displays. Located on the Seminole Tribe’s Big Cypress Reservation in the Florida Everglades, the 5,000 square foot museum is just three miles from Billie Swamp Safari Eco-Heritage Park. South Florida Science Museum and Planetarium, Miami- During the last decade, the Museum has expanded to provide space for 4,000 member families, over 250,000 annual visitors, one of the largest summer science camps in the nation (ages 3 to 14) and countless additional exhibits, collections and activities. The yearly operating budget has grown to 2.5 million dollars. Stranahan House - A guided tour of Fort Lauderdale's historic Stranahan House is like a magical journey through time. Experience a link to the time when the Seminole Indians made friends with a young Ohioan who came to the frontier settlement now known as Fort Lauderdale. Imagine the young Frank Stranahan winning the hand of Ivy Cromartie and building her a home so charming and enduring it serves today as a unique museum. The Florida vernacular style Stranahan House has served as a trading post, post office, bank and town hall. Restored to its 1913 configuration, it's a "must see" in South Florida. Vizcaya Museum & Gardens - Vizcaya is a National Historic Landmark. Vizcaya was built by American industrialist James Deering, who wintered on the property from 1916–1925. Today, the extraordinary European-inspired estate includes a house filled with art and furnishings, ten acres of gardens on Biscayne Bay, a hardwood hammock (native forest), and an historic village that is being restored for public enjoyment. Young At Art Children's Museum - Young At Art, is South Florida's unique, hands-on children's museum. Enter a new dimension of learning and creativity by touching, exploring, creating, imagining and enjoying the limitless possibilities of art.